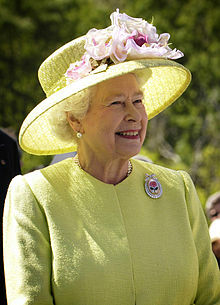 Elizabeth II (born 1926) is the current queen of the United Kingdom. She is the oldest monarch to sit on the English throne. Her reign has seen a number of social and political changes which Elizabeth II often realises and adapts to. Simple: I say to you that my whole life, whether it will be long or short, shall be dedicated to your service and the service of our great Imperial family to which we are all a part of. About the quote: Princess Elizabeth speaking to the Commonwealth at Cape Town in 1947. "I think everybody really will concede that on this, of all days, I should begin my speech with the words ‘My husband and I’." Simple: I think everyone will accept that on this, of all days, I should begin my speech with the words ‘My husband and I’. About the quote: Speaking at the Guildhall on her 25th wedding anniversary. "In the words of one of my more sympathetic correspondents, it has turned out to be an ‘annus horribilis’." Simple: In the words of one of my more understanding friends, it has turned out to be a horrible year. About the quote: Speaking about the year 1992, stained by family breakups and a fire at Windsor Castle. "I for one believe that there are lessons to be drawn from her life and from the extraordinary and moving reaction to her death." Simple: I for one believe that there are lessons to be learnt from her life and from the outstanding and moving response to her death. About the quote: Speaking to the country about the death of Diana, Princess of Wales. "I sometimes sense the world is changing almost too fast for its inhabitants, at least for us older ones." Simple: I sometimes feel the world is changing almost too fast for its people, at least for us older people. About the quote: On a tour of Pakistan, October 8, 1997. "Please don't be too effusive." Simple: Please do not be too emotional. About the quote: To the Prime Minister, about the speech he was going to give celebrating Elizabeth's 50th wedding anniversary. "Think what we would have missed if we had never...used a mobile phone or surfed the Net—or, to be honest, listened to other people talking about surfing the Net." Simple: Think what we would have missed if we had never...used a mobile phone or searched the internet—or, to be honest, listened to other people talking about searching the internet. About the quote: Looking back on developments in technology over the past 50 years. "I thank you also from the bottom of my heart for the love you gave her during her life and the honour you now give her in death." Simple: I thank you deeply for the love you gave her during her life and the honour you now give her now she has died. About the quote: Address to the nation following the death of Queen Elizabeth, the Queen Mother, April 8, 2002.